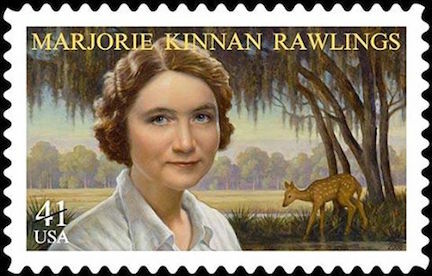 Marjorie Kinnan Rawlings (August 8, 1896 – December 14, 1953) was an American novelist and memoirist best known for The Yearling, the story of a boy who adopts an orphaned fawn. It won the Pulitzer Prize for fiction in 1939 and was subsequently made into a successful movie. 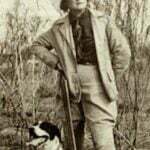 She’s also known for her writings about her adopted home in Cross Creek, Florida, where she bought an orange grove in the late 1920s and lived for many decades. She was fascinated by the people and local culture, and gathered her observations into a memoir, Cross Creek, and a compilation of recipes, Cross Creek Cookery, both published in 1942. Marjorie’s father was an attorney for the U.S. Patent Office. Growing up outside Washington, D.C., the family lived on a farm. 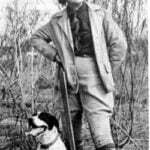 There, and in the nearby hills of Maryland and Virginia, Marjorie acquired the love of nature that would later permeate her writings. In 1926, Marjorie and Charles visited his brother in the northern part of Florida, and there she had an epiphany. While out on a hunting trip, she became a bit lost, and it was a metaphor for her life. Two years later, after receiving a modest inheritance from her mother, Rawlings and her husband moved to Florida and purchased a 72-acre orange grove and farm in the north Florida hamlet of Cross Creek. She described it as “remote land of fertile hummock and unfenced pasture and ancient wood and orange grove, four miles from the nearest village. The orange grove was intended to support her writing, but that was a tall order. There were all sorts of challenges: Mosquitos, drunken farm hands, frosts that ruined the orange crops, termites, and wayward farm animals. Marjorie was attracted to the eccentric locals of Cross Creek, but they were wary and at first resisted her eager questions and interest. Eventually they warmed to her, and she began recording detailed descriptions of the people, their dialect, the flora and fauna, and recipes. In 1931, after years of rejection, Scribner’s Magazine published two of her short stories, clearly inspired by Cross Creek and its residents. The pieces, “Cracker Chidlings” and “Jacob’s Ladder” were poorly received by the locals. The year 1933 brought both success and pain for the rising author. Rawlings’ first novel, South Moon Under, was published and well received, validating her pursuit in writing about rural Florida life. It was chosen for the Book-of-the-Month Club selection and was a finalist for the Pulitzer Prize. The recognition and income from the novel’s success brought about an opposite reaction from her husband; he grew jealous and began criticizing her work, eventually moving out. He was also sick of the rough existence on the orange grove. She filed for divorce in 1933. After her divorce, Rawlings punged into fiction writing. She immersed herself in her surroundings, embarking on a boat trip with a friend down the Florida St. Johns River. The trip recharged Rawlings and fueled her with new ideas and inspiration for her writing. By now, it was her writing that was supporting the orange grove, rather than the other way around. Perhaps recognized as Rawlings’ best-known piece of fiction, The Yearling was published in 1938. It tells the tale of a young Florida boy, Jody, and his pet deer, who he is forced to shoot after it’s caught eating his family’s crops. 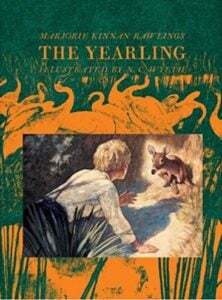 The Yearling was an instant bestseller and won a Pulitzer Prize in 1939. The Yearling might now be seen as a “young adult” novel, though at the time, this wasn’t yet its own genre; yet it’s a book for all ages. The story can be read on its own merit, or seen as a parable. In 1941, Rawlings was remarried to Norton Baskin. A year later, she published Cross Creek. In addition to the regular and book club editions, it was released in a special armed forces edition to be sent to servicemen during World War II. In 1943, Rawlings faced a libel suit surrounding Cross Creek. It was filed by her neighbor, who felt that Rawling had insulted the family that “Jacob’s Ladder” was allegedly inspired by. Rawlings eventually won the case and enjoyed a brief moment of satisfaction, but the verdict was overturned in appellate court and she was ordered to pay damages in the amount of one dollar. Other than Cross Creek Cookery, no other sequel would ever be published, due to the drama surrounding the lawsuit. 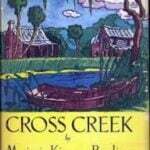 Cross Creek Cookery was published in 1942, right on the heels of Cross Creek. 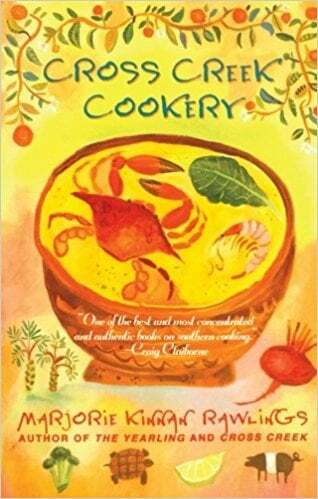 A collection of recipes and lore reflecting the cuisine of her adopted home, some of its offerings aren’t for the feint of heart or the vegetarian-inclined. It includes recipes like ‘possum pie, alligator-tail steak, and turtle meat and eggs. Marjorie sometimes found writing a painful and laborious process, but she adored cooking. 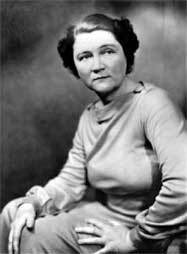 She loved holding forth with her kitchen and entertaining tips, and you can glean some of them in her inimitable forthright style in Culinary Wisdom from Marjorie Kinnan Rawlings. Rawlings’ last novel, The Sojourner, was published just before her death in 1953. Set in Michigan, this character study of a man and his relationship with his family was well received. Her last years were spent in a town just south of St. Augustine, Florida, where her husband owned a restaurant, but she left her heart in Cross Creek and its orange groves. As she wrote, she had merely been a tenant in a land owned by the redbirds and whippoorwills and blue jays. 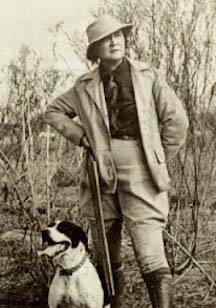 Marjorie Kinnan Rawlings died on December 14, 1953. She donated most of her manuscripts to the University of Florida at Gainesville, where she had briefly taught a creative writing course. Rawlings’ Cross Creek house and farm yard were listed in the National Registry of Historic Places in1970, Today the property is designated as The Marjorie Kinnan Rawlings Historic State Park. In 1983, Cross Creek was adapted into a film starring Mary Steenburgen. The Yearling, first made into a film in 1946, was remade into a TV film in 1994. Dear Literary Ladies: Does one need connections to get published? Does one need connections to get published?